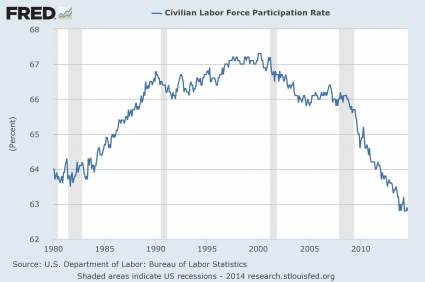 GLOBAL POLITICAL AWAKENING: If The Economy Is Recovering, Why Is The Labor Force Participation Rate At A 36 Year Low? Should we be concerned that the percentage of Americans who are either working or looking for work is the lowest that it has been in 36 years? In August, an all-time record high 92,269,000 Americans 16 years of age and older did not "participate in the labor force". And when you throw in the people that are considered to be "in the labor force" but are not currently employed, that pushes the total of working age Americans that do not have jobs to well over 100 million. Yes, it may be hard to believe, but there are more than 100 million working age Americans that are not employed right now. Needless to say, this is not a sign of a healthy economy, and it is a huge reason why dependence on the government has soared to absolutely unprecedented levels. When people can't take care of themselves, they need someone else to take care of them. 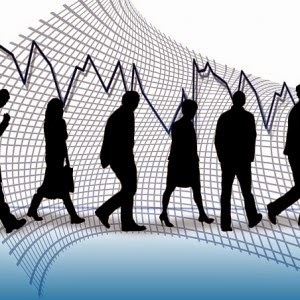 If the percentage of people in the labor force continues to decline like it has been, what is that going to mean for the future of our society? 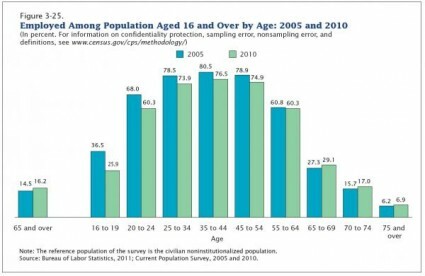 Well that's very odd, because it was only two months ago that the Census wrote the following : "Many older workers managed to stay employed during the recession; in fact, the population in age groups 65 and over were the only ones not to see a decline in the employment share from 2005 to 2010 (Figure 3-25)... Remaining employed and delaying retirement was one way of lessening the impact of the stock market decline and subsequent loss in retirement savings. Each month, the U.S. economy has to add somewhere between 100,000 and 150,000 jobs just to keep up with population growth. Since job creation has been tepid at best in recent years, the only way that the government has been able to get the official unemployment rate to steadily "go down" has been to remove millions upon millions of Americans from the labor force. According to the official government numbers, since 2007 768,000 jobs have been added to the economy, but a whopping 13 million Americans have been added to the numbers of those "not in the labor force". As a result, the official unemployment rate has magically been "declining". In other words, about a third of all workers in the country are "temps" at this point. I don't know about you, but to me that is an extremely alarming statistic. Some days, her sales bring in $150. Others, they don't break $20. If our labor force participation rate continues to fall and the quality of our jobs continues to decline, the middle class will continue to shrink. For much more on this, please see my previous article entitled "30 stats to show to anyone that does not believe the middle class is being destroyed". The St. Louis Federal Reserve thinks it has the answer: A paper the central bank branch published this week blames the low level of money movement in large part on consumers and their "willingness to hoard money." I certainly don't see a lot of people "hoarding money".